These Isle of Wight Woodland Apprentices are quickly developing the skills and gaining the practical on-the-job experience that will provide a valuable step-up to securing full-time permanent employment. Money has been shared with projects aimed to improve access to local nature reserves, conserve our most important historic buildings and enabling people of all ages and ability to take an active role in celebrating our cultural heritage. 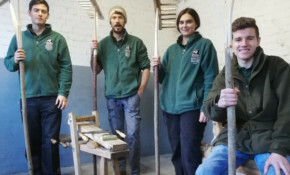 The awards include funding for local conservation volunteers to improve the condition of our nationally important river, woodland, chalk grassland habitats, as well as support for local heritage societies to unlock the stories of a bygone town. The beautifully ornate fountain in Ryde's Esplanade Gardens was originally designed by renowned Victorian landscape gardeners James Pulham and Son. It's undergone a restoration thanks to the Heritage Lottery Fund. Volunteers French Barlow and William Phillips have each won individual awards for Outstanding Achievements while the Green Army have won a group award in recognition of the whole team! Hurrah for the volunteers from the IW Ramblers, Bembridge Green Town, Bembridge Parish Lengthsmen and a skilled team of contractors who have relaid and widened the path through the former quagmire. The Isle of Wight has had a lot of bad news recently with Government funding cutbacks. This is great news, that's going to enhance the Island. Under the management of the East Wight Landscape Partnership, Down to the Coast will reconnect fragmented habitats in our woodlands and river systems as well as provide the support to enable more people to take an active role in managing our landscape. Thanks to Pete Fellows for this report from the first meeting of the Isle of Wight Orchard Group.